Pittsburgh was their first victim. Then it was Gonzaga, followed by LaSalle and Ohio State. The Wichita State Shockers have seemed to dominate the four teams they have played thus far in the tournament. The clichéd phrase “shocking the nation” has been tossed left and right since the Shockers knocked out Gonzaga in the Round of 32. But has Wichita State’s “Cinderella story” really been that shocking? I know it may be hard to believe, but there are more than just redneck farm boys on this basketball team. There is deep, athletic talent coached by an incredibly intelligent staff. When you put two and two together, Wichita State is composed of an ideal tournament roster. Their point guard, Malcolm Armstead, is a dauntless guard who takes the ball to the hoop with confidence. Red shirt freshman Ron Baker’s three point shooting has been surreal in the tournament, hitting 40% of his attempts from long range. The Shocker’s big men, Cleanthony Early and Carl Hall, are strong rebounders who can be scoring threats. Along with impressive starters, Wichita State is complemented with arguably the deepest bench in the tournament. All but two of the Shocker players average 11+ minutes per game, and none more than 29. With nine players playing over 25% of the game, Wichita State lacks visual tiredness, giving them an advantage with their fresh legs. The issue for the Shockers, as the second best team from the Missouri Valley Conference meets the Big East champion, Louisville, is experience. This Saturday, Wichita State will have their biggest game in school history against Louisville. Wichita State’s leading scorer, Early, averages just 13.7 points per game. When compared to Louisville’s Russ Smith, who puts up 19 a game, Early looks like David facing Goliath. The same goes for every Shocker when put next to every Cardinal. 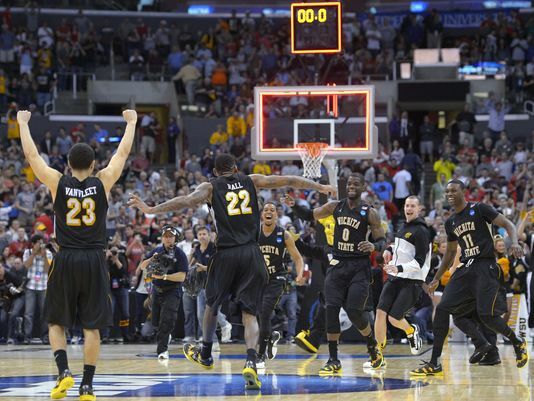 However, the stamina and togetherness Wichita State has could spell doom for the Cardinals. Unfortunately for the Shockers, Louisville is motivated more than ever because of Kevin Ware’s devastating leg injury suffered in the Elite Eight. I believe the winner of this game will face Michigan in the National Championship. There, I think the champion is a toss-up. Louisville’s motivation could carry over into Monday’s game, benefiting them greatly. Wichita State’s run could continue into the championship game, where all of the pressure would be on the expected-winner, Michigan. The Wolverines’ Trey Burke has been absolutely red hot, though, and has his team fearless. Although this Final Four has been unlike those in previous years, whoever emerges on top will still have well-earned it. This entry was posted in Basketball, Basketball, Midwest, National and tagged Final Four, Louisville, NCAA, Shockers, Wichita State.